The Delta Blues Museum web site has a section designed to give a vivid, graphic overview of the essential facts of a blues master's life and musical highlights. Muddy Waters and Son House were our first "Explore & Learn" programs. Since then, we have added Charlie Musselwhite, Robert Johnson and a couple of Blues Migration/Exploration programs, with more Explore & Learn projects in the works. So, what are you waiting for? Click here to "Explore & Learn" about various blues artists and blues history. The purpose of the Delta Blues Museum’s Arts and Education Program is to continue the great musical tradition born in the Mississippi Delta: the Delta blues. The Arts and Education program teaches students to play music and keeps the history of the Delta blues alive. Students are taught to play the blues on the instrument or instruments of their choice. Instruments – drums, guitars, and keyboards – are provided by the museum for use in the classroom and authorized performances. However, we encourage students to purchase their own instruments. Instructors utilize the oral tradition, recorded music, video, instruction books, and handouts to educate the students in a classroom environment. The students progress from learning the basics of playing music to working together as a band. The Delta Blues Museum sponsors special educational programs and workshops in conjunction with local festivals and events. In the past, these have included sessions such as piano workshops with Henry Gray; harmonica workshops with Geneva Red; and oral history conversations with David “Honeyboy” Edwards, Charlie Musselwhite, and others. Check the calendar for these special programs. To access the lesson plans, which can be adapted to various grade levels, you must first register. If you have already registered, please enter your email address and password. and password to access the lesson plans. To have the Traveling Trunk, an interdisciplinary and interactive educational supplement that includes a map of the railroad from New Orleans to Chicago, a guitar, a diddley bo, exhibit panels, and more, visit your classroom, please contact the Museum, info@deltabluesmuseum.org. 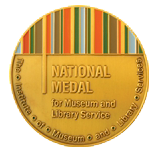 2013 Winner of the National Medal for Museum & Library Service. 2014 Winner of the National Arts & Humanities Youth Program Award (NAHYP) for the Museum's Arts & Education Program. Teacher Workshop - Great Migration - November 05, 2016 - NEW DATE! The Delta Blues Museum is pleased to offer a workshop on "The Great Migration" on Saturday, November 05, 2016 from 9:00am - 4:00pm. Teachers of all subjects and grade levels are invited to participate and will have the opportunity to earn .7 Continuing Education Units (CEUs). The Registration is $25 - the workshop fee includes lunch, snacks and CEUs. The Delta Blues Museum will host its first annual Guitar and Drum Camp from June 20 - 24th, 2016. Students from ages 9 - 18 will focus on lead guitar, bass guitar, and drums - interested students should already have a basic knowledge of their instrument of choice. The camp will begin on June 20, 2016 and end with a public performance on June 24, 2016 on the Museum stage. The camp hours are 9:00am to 12:00pm (noon). Instructors include Walt Busby, John Holmes, Lee Williams and other special guests. Stop by or call the Museum to register. The Delta Blues Museum and the University of Mississippi’s Center for the Study of Southern Culture will host a teacher workshop on the Mississippi Blues Trail on July 28 to 30, 2015. The 3-day workshop will be held at the Delta Blues Museum in Clarksdale and is open to teachers of all subjects and all grade levels. Registration is available June 20, 2015 to July 20, 2015. Early closure of registration may occur if attendee limits are met prior to July 20, 2015. Sessions will include discussions about the blues, how to incorporate the blues into classroom teaching, and resources available to teachers. Attendees will receive a bound copy of lesson plans created by the Mississippi Arts Commission for the Mississippi Blues Trail Curriculum. While the teacher booklets are designed to complement the Mississippi Blues Trail, they also work as stand-alone pieces in any classroom. Upon completion of the 3-day workshop, teachers will receive 1.6 CEU credits. The workshop is free to attendees and offers an optional purchase for workshop lunches and reception. The Mississippi Valley State University Ninth Annual B.B. King Blues workshop is scheduled for Friday, June 5th, beginning at 9:00 a.m.